Tweeting about the Masters might never be more fruitful than it will be this year. If you do so, every birdie made on Sunday could get you free Natty Light for a year. It’s true and it’s simple. 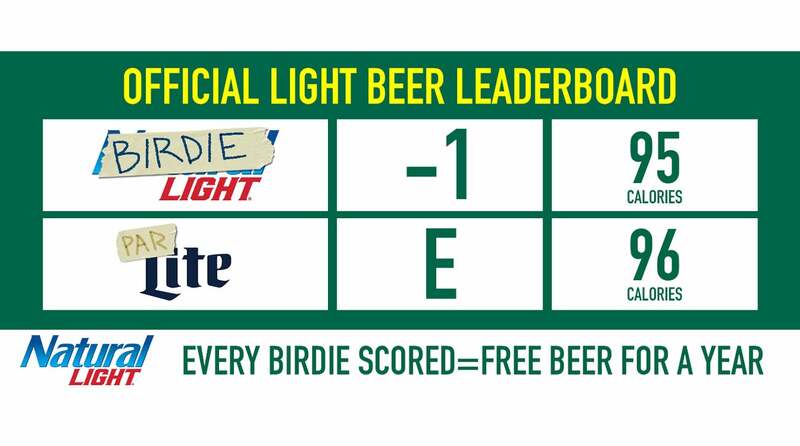 Natty Light is promising free beer for a year to select users who tweet #BirdieLight and #Sweepstakes. Natty Light is trying to make note of it having one fewer calorie than Miller Light, so it’s focused on birdies. Each Sunday birdie will crown a new ready-to-drink winner. Just how many will that be? Well, during 2018’s final round shootout (between Patrick Reed, Rickie Fowler and Jordan Spieth) 234 birdies were made. In 2017, that number was 213. So it’s nearly a done deal that 200 tweeting fans will earn free beer for a year from Natty Light. Go crazy, folks! Claim your cases of Natty Light. This is not the first time Natty Light has dipped its toes in the Masters. Nor is it a stranger to promotion. Back in 2017, the brand created a pop-up shop at the nearby Midas Auto Shop called “The Natty Shack.” Smylie Kaufman, sponsored by Natty Light at the time, made an appearance at the college football-like tailgate. The Masters is one of the biggest events in sports, and brands often try to take advantage of an engaged audience. Just last year, as its “Dilly, Dilly” campaign was taking off, Bud Light heard their tagline was barred from being cheered at Augusta National. The brand quickly made use of the news socially.